Jorge's Place: CD OF THE WEEK: HELLO,DOLLY! CD OF THE WEEK: HELLO,DOLLY! On the day of my 11th birthday my mother took me to the cinema to see HELLO,DOLLY!. Three things happened on that day. I fell in love with the movie, I fell in love with Barbra Streisand and I fell in love with the Jerry Herman (of whom I never heard before) score. Later, much later, I discovered that a lot of people hated the fact that Streisand took the leading role, but for me she was perfection. After seeing the movie I went crazy looking for the movie soundtrack, but I was only able to get a copy of it (on a audio tape) years later. Since then it become my favorite of all movie soundtracks, a place it still holds “near and dear to my heart”. When, later, I bought the Broadway cast recording with Carol Channing, I confess I was a little disappointed. Don’t get me wrong, I love Carol, but she didn’t have the pipes of Miss Streisand. But let me talk about this unforgettable soundtrack. Things begin beautifully with the amusing “Just Leave Everything to Me” that suits Streisand’s talents; later she has another great comic number a la Mae West with “So Long Dearie”. Between these two numbers she strongly delivers the powerful “Before the Parade Passes By” and no one sings it like she does. She’s also at her best with the sad ballad “Love is Only Love”. It’s true, Walter Matthaw is a terrible singer, but he has his moment with the sexist “It Takes a Woman”. On the other hand, Michael Crawford is great as Cornelius, sings the sweet “It Takes a Moment” (later used in WALL.E) and together with Marianne McAndrew, Danny Lockin and E.J. Peaker give us the amusing “Elegance”. McAndrew, as Irene Molloy, has her solo with “Ribbons Down My Back”, the poorest song of the score. Back to Streisand and my three favorite numbers of the movie. The third one is the terrific “Dancing”, which unfortunately wasn’t recorded in its entirety for the soundtrack. The second one is the fabulous title song, where she leads the male company and has a classic moment with Louis Armstrong. The first one is the contagious and exciting “Put on Your Sunday Clothes”; I’m passionate about this song! I think it’s one of the best ever written and it never sounded better than in this soundtrack. I could put here all the positive adjectives I know, but that’s not necessary. I simply love this movie and its soundtrack. They are both irresistible! If you never listened to it, please say hello to Dolly/Streisand and company, you won’t regret it. Unfortunately, I never saw any of those great ladies on stage, but I saw a bootleg video of a revival of HELLO, DOLLY! with Carol Channing and I was disappointed. Carol was great, but I didn't enjoy the staging. I think it's impossible to compare Channing with Streisand; their Dollys are completely different and so are their voices and acting style. 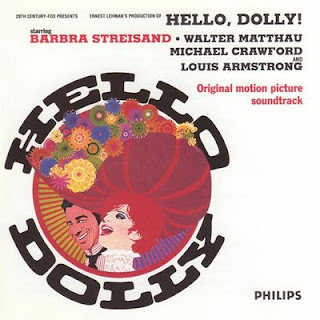 The movie was the first time I heard a score by Jerry Herman and Streisand (yes, she's too young for the role, but she looked much older) did full justice to the songs and so did Michael Kidd with the choreography.